When you play an action, Auridon Paladin gains Drain this turn. Auridon Paladin is a common Willpower creature card. It is part of the Core Set. "This day shall be auspicious." "Your loss is my gain." "Let me lighten your load." This card's ability applies the Enchanted card effect. 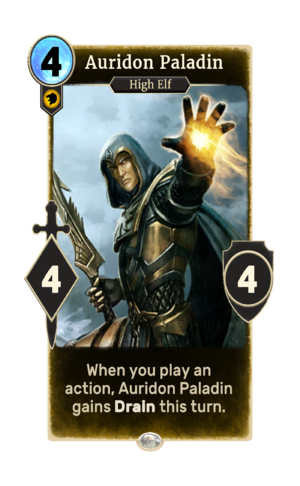 The card is named for the Summerset island of Auridon. The card was formerly called "Auridon Battlemage" as seen in prerelease materials prior to open beta. This page was last modified on 15 February 2019, at 11:45.